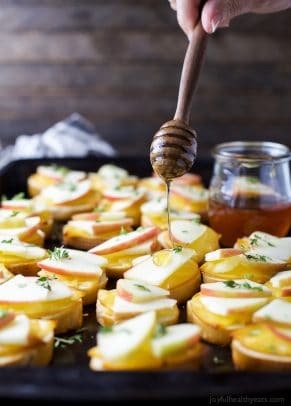 Delicious Sweet & Savory Holiday Appetizer Bites plus effortless entertaining hacks to ensure you have the best holiday party around! 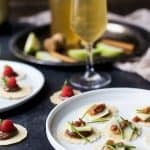 Delicious Sweet & Savory Holiday Appetizer Bites plus easy entertaining hacks to ensure you have the best holiday party around! 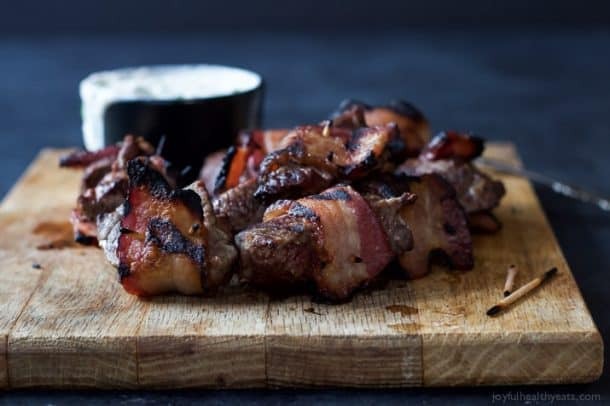 Apple Cheddar Bacon Bites + Raspberry Nutella Bites are sure to wow the crowd this holiday season! Now that Thanksgiving is behind us it’s time to focus on all those holiday parties I know you’ve booked on your calendar. There’s work functions, office Christmas parties, church parties, small group parties, friend holiday parties, neighborhood parties, cookie exchanges … the list goes on. All of it good and fun but sometimes life can get a little crazy around the holidays. Am I right? We try to focus on just the key few and then let the rest pass by. After all it is the holidays, I want to enjoy time with family. Not be running from one function to the next. 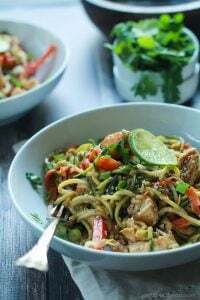 One of the ways I plan on taking it easy this holiday season is by focusing on bringing light and healthier recipes to those holiday parties. 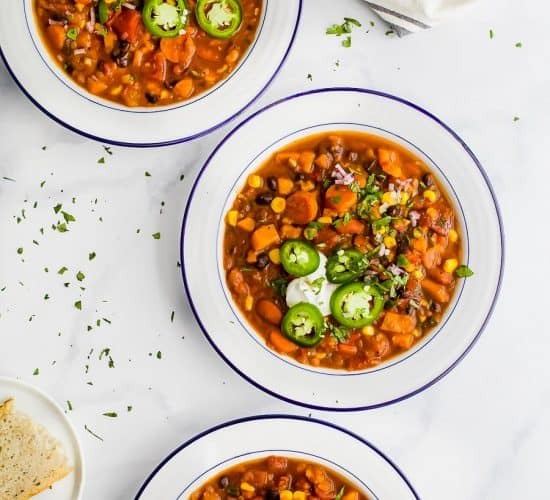 Things that can be made in a crock pot, cheese platters or things that can be made in 30 minutes or less. 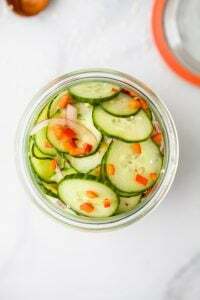 Basically things that are no fuss but still pack a punch of flavor. So how do you host the ultimate holiday party? In my opinion the perfect way to entertain a party is to not be in the kitchen the entire time. You are hosting, make sure you’re mingling with those you invited! Have the wine chilled. Glasses out. (maybe even a dry erase marker so people can write their names) If you’re making a holiday cocktail, make it in a big pitcher so you’re not having to make each drink by hand. A place for people to drop off the appetizers they’ve brought. Plates, napkins and utensils in clear site. To me, it’s all about the prep so that when the actual event happens you’re free to relax and enjoy all the friends and family. 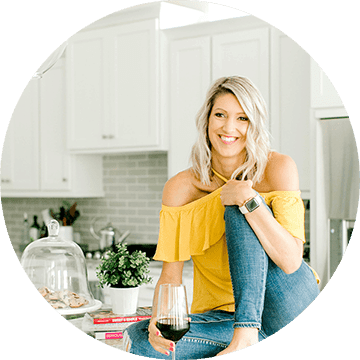 Most people want to host a gathering but the idea of all the components that need to come together in order for that function to happen can be overwhelming. Let me help you take the work out of it. 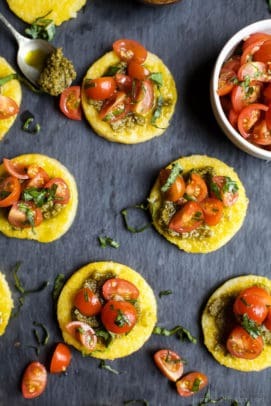 One of my little simple “party hacks” is buying delicious crackers or crisps and adding different toppings to it. 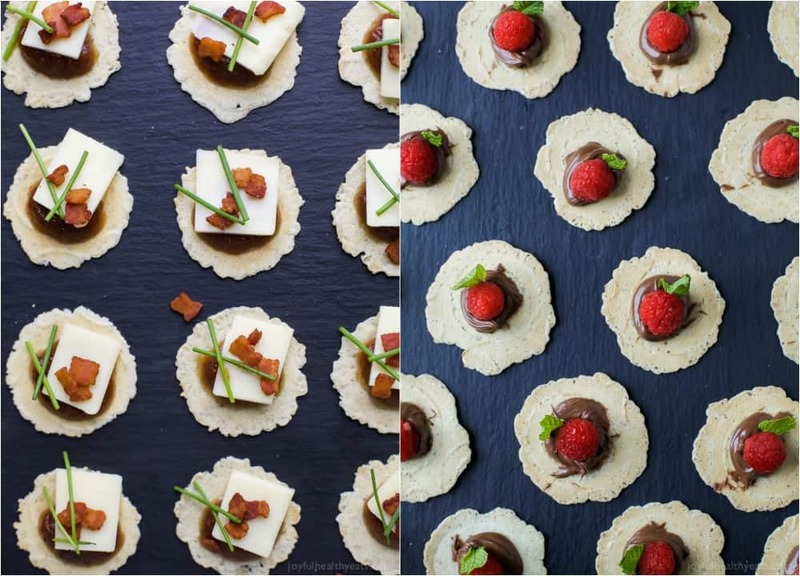 It’s super effortless and your guests will be wowed by the little bite sized pieces. The only problem you’ll have is trying to decide how many to make because they’ll be gone in seconds! 34 Degrees Crackers are specialty crackers that I recently came across and have fallen in love with. 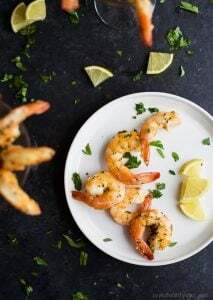 First off, their flavors are delicious – they have natural, whole grain, toasted onion, black pepper, rosemary, vanilla, chocolate, lemon and even cinnamon. 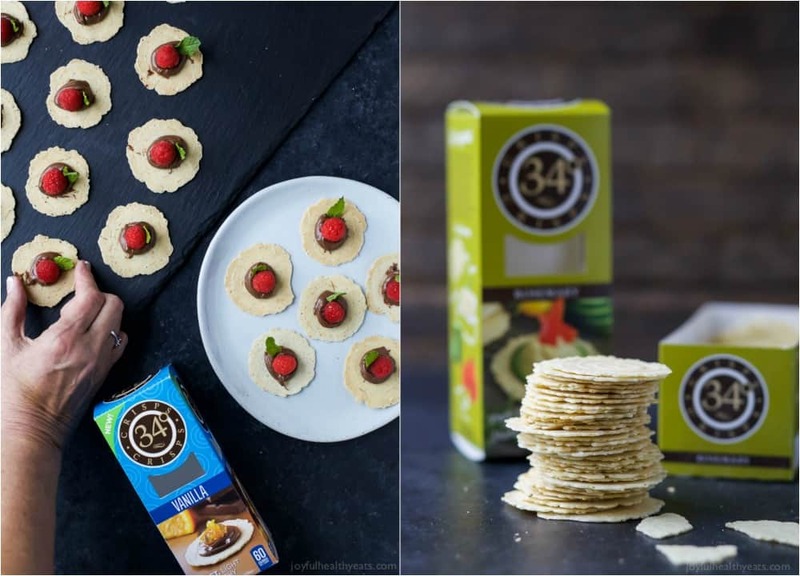 Savory or sweet, naked or topped, 34 Degrees Crisps are little rounds of natural, small-batch goodness with a delicate design and imperfectly beautiful edges. 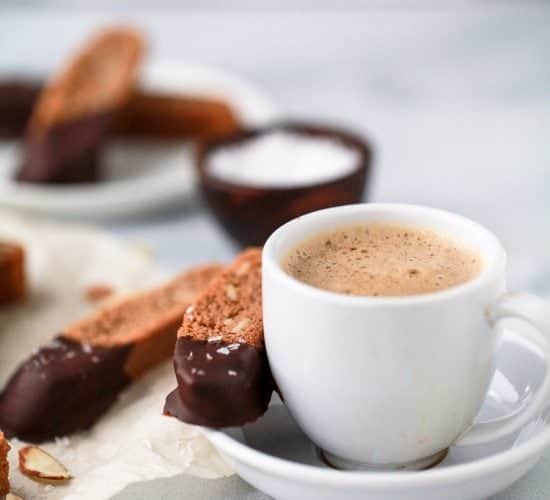 They use a handful of natural ingredients and carefully bake their wafer-thin crackers until they are subtly toasty and overtly tasty. They are so delicate and delicious! 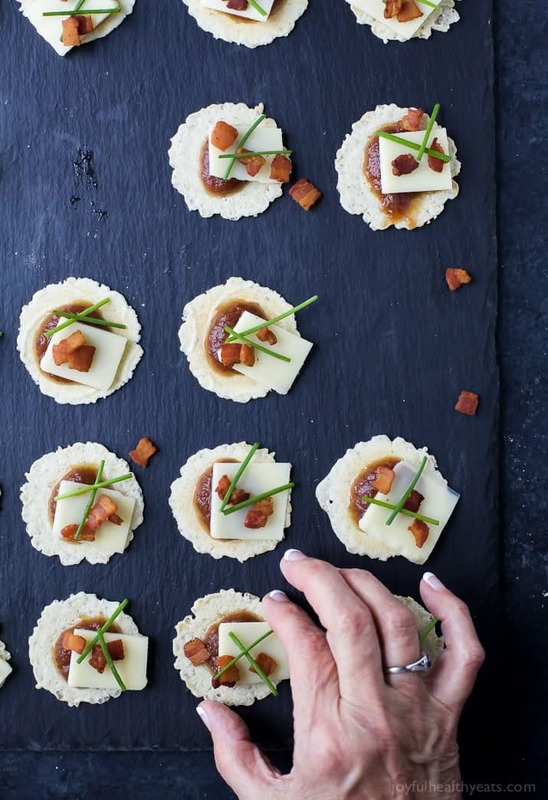 These crackers are the key to effortless entertaining. They pair perfectly with any cheese! And just in case you’re creating a cheese board make sure to check out my post for how to create the ultimate cheese board. But, they were created to be eaten plain or topped! Honestly, I’ve eaten these plain and they are delicious – especially the vanilla ones. But it’s way more fun to top them with unique creations to show off your creativity. Nothing fancy. Just simple subtle flavors to really enhance the flavor of the cracker. Today I decided to do a savory bite and sweet bite. 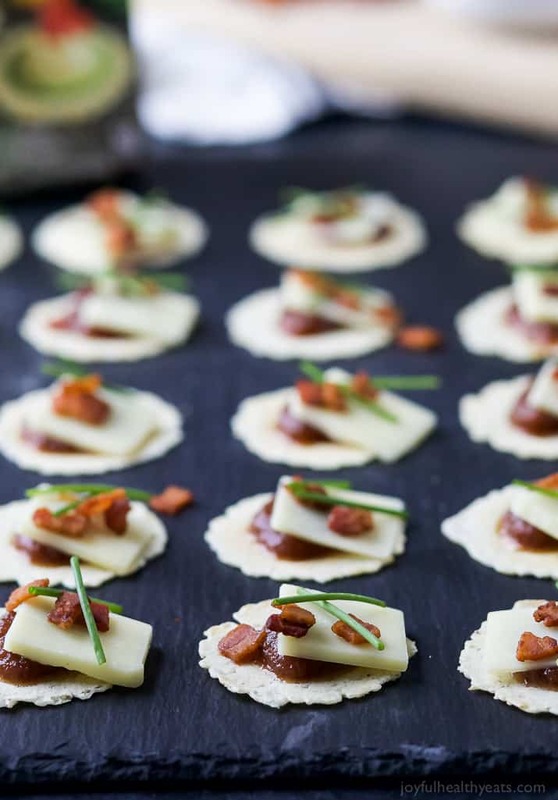 For the savory bite, I used the 34 Degrees Rosemary crackers and topped it with apple butter, salty aged Cheddar Cheese, crispy Bacon and then some chives for fresh color. 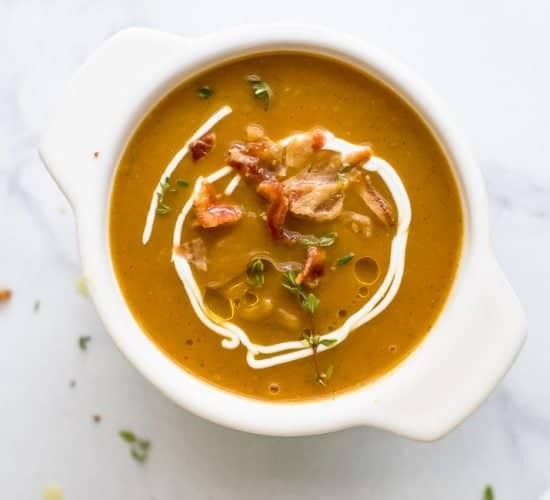 So basically it’s a Apple Cheddar Bacon Bite – and it’s incredible! The only thing you need to be careful of, is to not put too much of the apple butter on. It’s starts to soak through the cracker and will break. 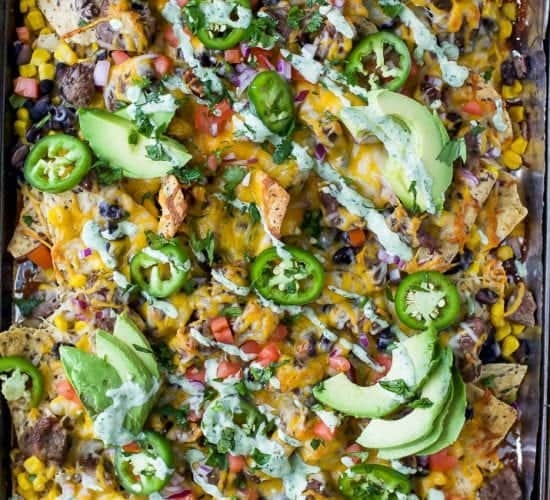 I’d recommend making these 15 minutes before people start to come over. You can get all ingredients ready so all you have to do top them and lay them out! The next bite is a sweet bite. 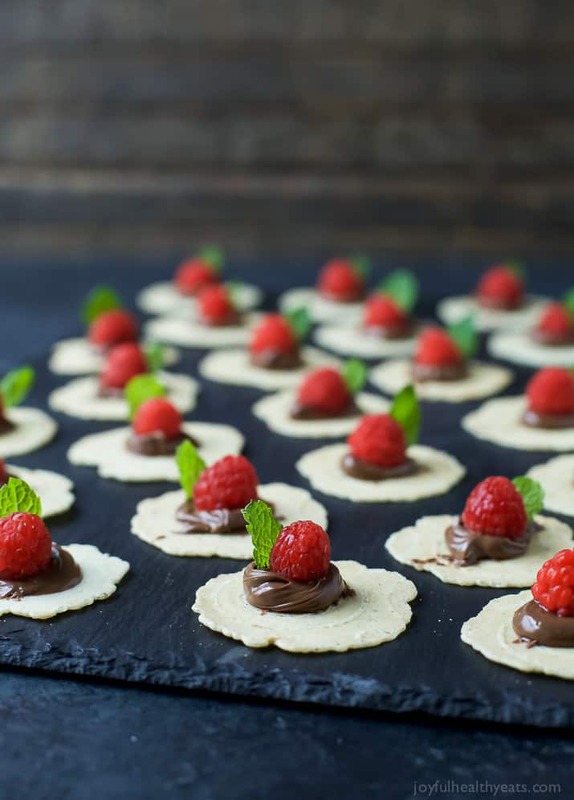 I used the 34 Degrees Vanilla crackers and topped it with nutty Nutella, a fresh raspberry and mint for some garnish. These, as you might guess, were my favorite. But I’m a sucker for all things sweet! You’ll love the flavor combo of these, each one is distinctively different but equally delicious. So if you’re looking for an effortless entertaining option be sure to pick up a few of these boxes in various flavors. They’d be great on a cheese board, served with a baked brie or spinach artichoke dip. You can eat them plain or top them with deliciousness like I did. Whatever you decide, just be sure to grab them before they run out. You can find 34 Degrees crackers in the deli department of your local supermarket – near the cheese! Or use their store locator on the website. Lay rosemary crackers out on a serving platter. 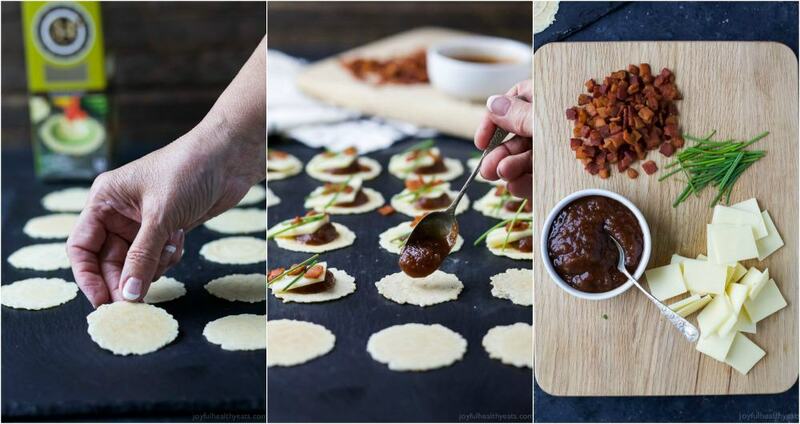 Top each cracker with 1 teaspoon of apple butter, a slice of aged cheddar cheese, 3-4 crispy bacon bits, and fresh chive for garnish. 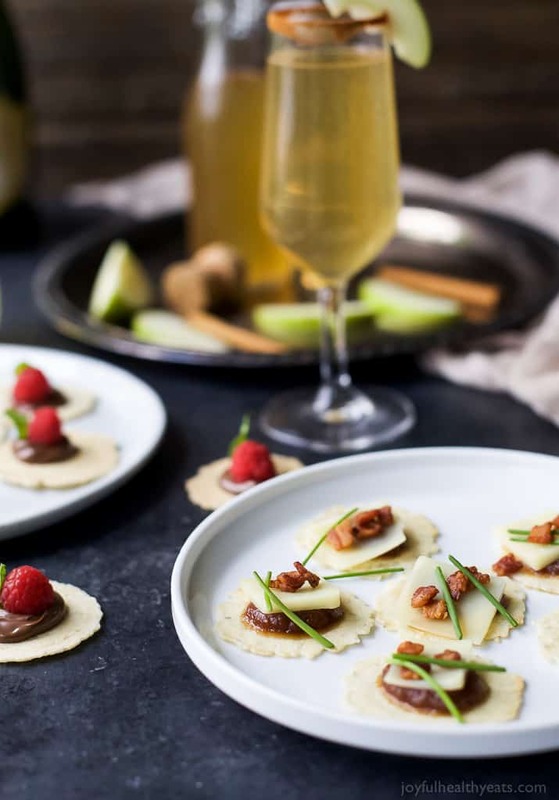 Lay vanilla crackers out on a serving platter. 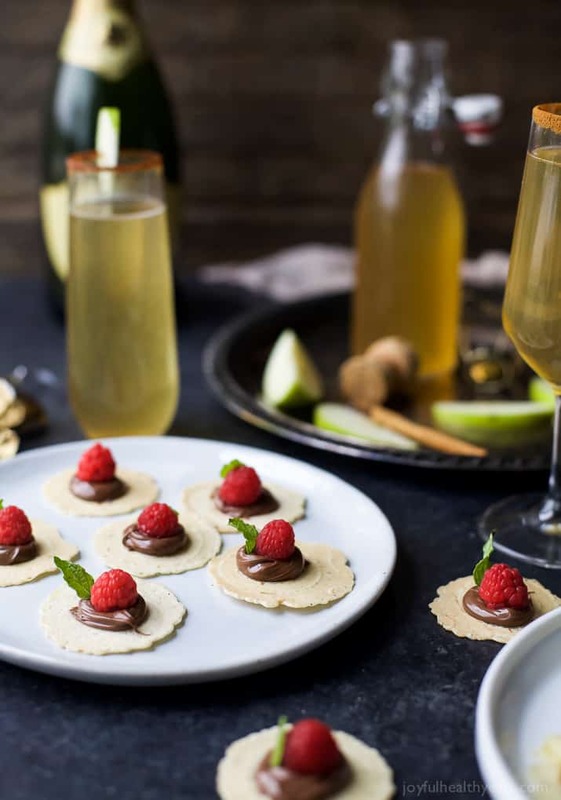 Top each cracker with 1 teaspoon of nutella. Top with a fresh raspberry and a single mint leaf. 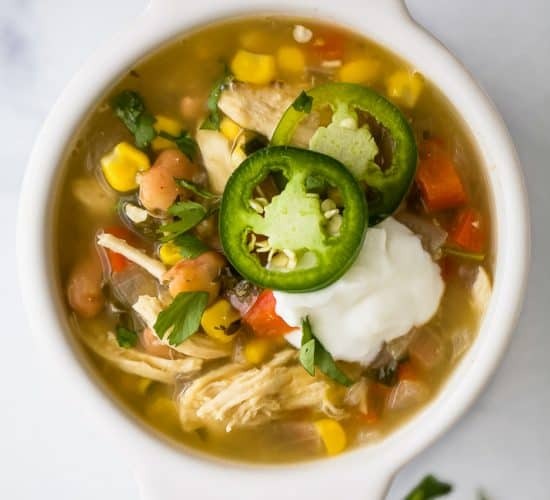 IF YOU MAKE THIS RECIPE, BE SURE TO SNAP A PIC AND HASHTAG IT #JOYFULHEALTHYEATS and #GATHERROUND34. I LOVE SEEING WHAT YOU MAKE! 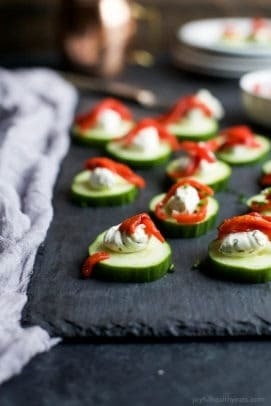 Want More Festive Holiday Party Bites? 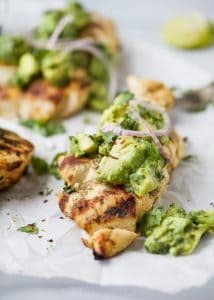 I love how easy these are to prepare yet they look like they are super fancy! The Nutella ones are calling my name!! I know right! So fancy and so effortless! You’ll love them! These are perfect for holiday entertaining! Just wait till you try them! They’re incredible! Appetizers are the best part of any holiday! Amen to that! Especially when they look and taste like this!